The 24th edition of the Pays de Fougères international rally on 25-28 May 2018 brought together 180 crews from a dozen European countries, as well as an entrant all the way from Thailand. For the first time, the rally was chosen by FIVA (the Fédération Internationale des Véhicules Anciens or international federation of historic vehicles) as one of the 10 venues where a FIVA Best Preserved Vehicle award is presented. At the rally, Englishman Paul Chasney scooped the FIVA Best Preserved Vehicle award with his remarkable Alvis TF21 Graber Super from 1966, one of the last six bodies made by the famous Swiss coachbuilder Herman Graber. 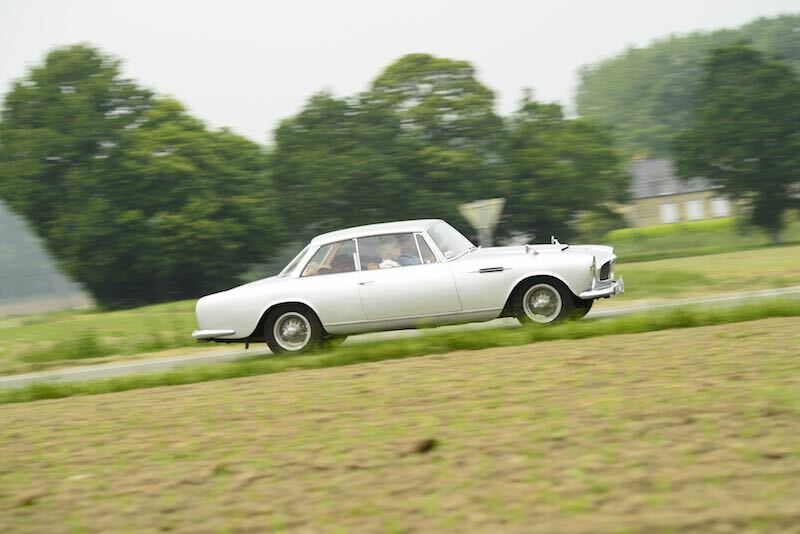 However, the judges (FIVA steward Rainer Hindrischedt and FIVA VP Communications Gautam Sen) were hard-pushed to choose between the Alvis and the superb 1959 Lancia Flaminia saloon of Claude-Michel Perseil, which was the close runner-up. The annual Pays de Fougères rally, organised every May by the Automobile and Heritage Association of the Pays de Fougères, was one of the first events to combine automobiles of the past with the architectural and gastronomic heritage of northwest France. It has always been less about discussing nuts and bolts and valves than discovering the many facets of a rich heritage, both mobile and immobile. Above all, perhaps, it’s a chance to introduce the general public to the intriguing world of historic vehicles, as the cars are exhibited at locations accessible to the public during the three days of the event — this year at Dinard, Granville and Fougères. Meanwhile, the Sunday afternoon of the rally sees each vehicle presented to the public with a detailed but lighthearted account of its history. Free-of-charge to visitors, the aim is to tell the story of each car, reviving happy memories and, it’s hoped, awakening the interest of the younger generation in our industrial heritage, in the aesthetics of car design, and in the people and human activities behind it all. This annual rally always manages to bring together cars that are rarely seen elsewhere. Rare and exclusive marques such as Marauder, Swallow Doretti, HRG, CG and Darracq joined the traditional luxury brands of Bentley, Delage, Delahaye and Rolls-Royce, not to mention sports cars from Alfa Romeo, Aston Martin, Bugatti and even a Ford GT40, to excite onlookers. The 2019 Pays de Fougères international rally will be held in the Fougères region, from 17-20 May.